Cut a piece of white cardstock 6 ¾” high by 8 ½” wide. Score in half at the 4 ¼” mark then fold and crease well. Use the corner punch to punch the two upper corners through both layers. Cut a piece of yellow cardstock 6 3/8” high by 4” wide. Use the border punch on the bottom edge and the corner punch/embosser on the two top corners. On this piece, stamp the border crocus along the left and right edges using the Daffodil Yellow inkpad. You will need a piece of white cardstock at least 6” high by 3” wide for the focal image. Using the onyx black inkpad, stamp the large crocus and written background image onto this piece of white cardstock and again on a scrap piece of white big enough for the large upright crocus image, and the small single crocus flower. Color in the images using the Copic and Stampin’ Up markers, outlining in blue on the largest base image. I used the YR04 Chrome Orange in the upright Crocus image for the inside of the flower petals. Fussy-cut the smaller single Crocus flower, some extra leaves and the upright Crocus with scissors. 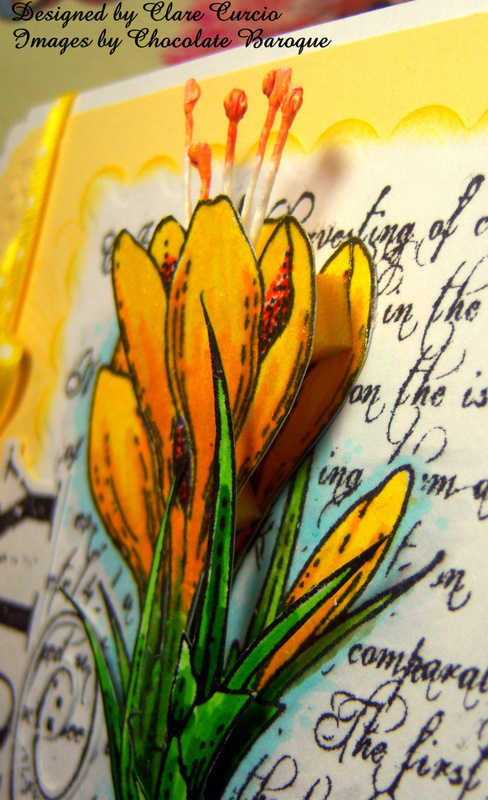 Cut the stamens to desired length, and tape or glue onto the back of the crocus images – set aside. On the largest image with the background text, use the largest scalloped rectangle die to center over the image and diecut using your favorite diecutting machine. Using the yellow inkpad and dauber, sponge all outer edges of the diecut image. On a piece of white cardstock scrap at least 4” by 3 1/2”, stamp one swirl on the left side of the cardstock, using the Daffodil Yellow inkpad. Using the onyx ink, stamp the word Beauty over the swirl. Fussy-cut the swirl/word image out with scissors and/or hobby knife. Position the yellow cardstock piece in the center of the front of the white card base. Adhere. Cut a piece of yellow ribbon with the white dots, 16” long. Tie around the left edge of the card into a little bow, weaving the end through the holes cut in the swirl. Pop the swirl/word “Beauty” up with pop dots and adhere partially over the ribbon, and the left edge of the focal image, vertically. Apply pop-dots or adhesive to the back of the small crocus, and position and adhere beneath the “B” in Beauty. Position the large upright crocus in the center of the focal image, and adhere with pop-dots on the top half only. Use adhesive for the bottom half, adhering flush and making the bottom of this cut piece line up with the base image, so it looks like it is growing out of this base. Finish off the inside as desired, and you are done. Any questions, please let me know. I’ll be happy to go over the directions step-by-step. 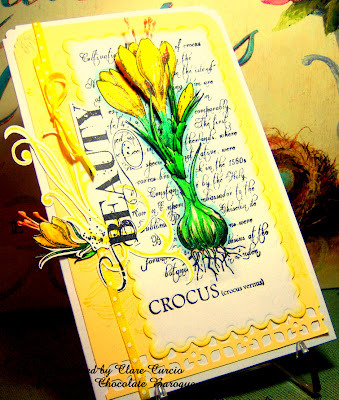 The dimension of the crocus is quite astonishing & your blue outlining so effective on the base layer. Your green leaves positively glow.